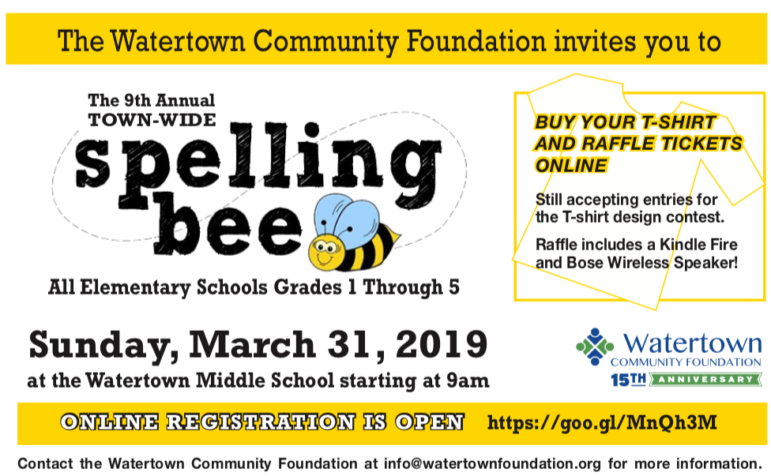 The Watertown Community Foundation invites you to join the 9th annual Town-wide Spelling Bee. The Spelling Bee is open to all elementary school students in grades 1-5. Online registration is open now by going to http://goo.gl/MnQh3M. Tickets for raffles or T-shirts can also be purchased online at the same site. Raffles include an Amazon Fire and Bose wireless speakers. The event will be held on Sunday, March 31, 2019, at Watertown Middle School, 68 Waverley Ave., Watertown. Contact the Watertown Community Foundation info@watertownfoundation.org for more information. Charlie- Thanks for sharing. Just one correction-It’s SUNDAY, March 31st!